Use the links below to read our Health Report Card, Community Health Assessments and other health data resources. If you would like to provide feedback on any of our health data, please enter your comment (and email address or phone number if you want us to contact you) and click the “Send” button. 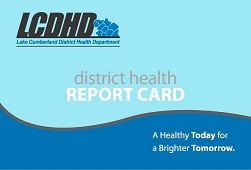 The Health Report Card contain statistics and analysis for each county within the district and compares that information with District, State, National, and Healthy People goals. Some statistics included in the report card are demographic information, economic information, birth and death data, infectious disease data, chronic disease data, etc. Many of the data sets contain trend graphs to give a better overall picture of the burden of disease within our region. Also included are charts, tables and analyses of the County Health Rankings. Analysis of data is a process of inspecting and modeling data with the goal of discovering useful information, suggesting conclusions, and supporting decision-making. The analysis of Lake Cumberland’s health data contained within the Health Report Card and the County Health Rankings help drive our community health improvement efforts. Also, review the minutes from our Data Analysis Committee. Health Coalitions across the Lake Cumberland District completed Community Health Assessments (CHAs) as part of the Mobilizing Action through Partnership and Planning (MAPP) Process in 2013/14. The Health Coalitions worked diligently collecting data and information required to complete these four assessments: National Health Performance and Standards, Community Themes and Strengths, Community Health Status and Forces of Change. The assessment booklets, provides statistical information, community input and environmental forces that determine a community’s health status, behaviors and needs. The data compares statistics for each county to both the district and state. 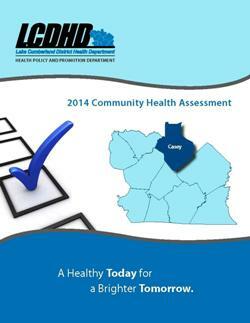 The Lake Cumberland Community Health Improvement Booklet is a result of the MAPP process. 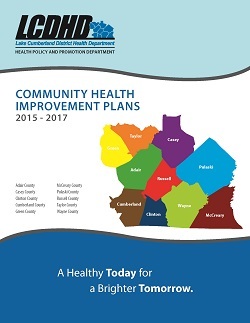 Each county created a health improvement plan to guide their steps toward a healthy community. These improvement plans will be implemented over the next three years. The plans are driven by all the community health coalition partners, to improve the health status of a county it takes everyone within a county working together.